On Tuesday 11th July we said our ‘official’ goodbye to Executive Head Teacher, Mr Fitzsimmons. Staff, governors, PTFA members and educational leaders gathered together to thank Mr Fitzsimmons for his service to the College. A mosaic was unveiled in recognition of his time at HCC, with a fun addition of ‘DF woz ‘ere 2003-2017’ (there was a slight hitch with the unveiling!). 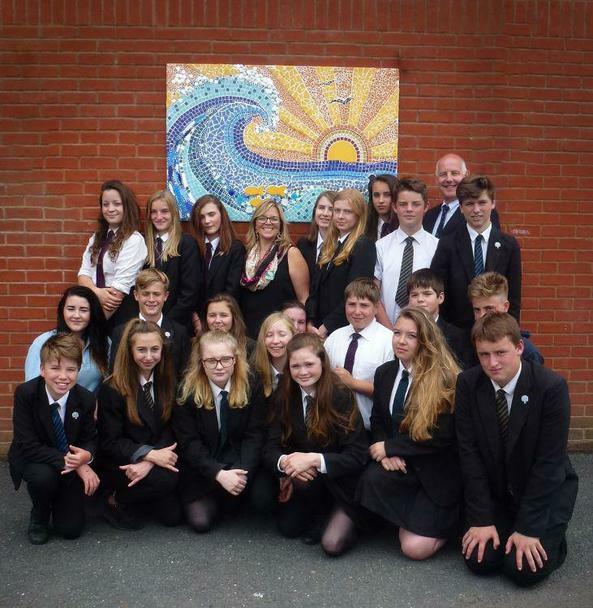 The mosaic was completed by Mrs Bloxham and her Year 9 Art group. A big thank you to our canteen staff for laying on a wonderful cream tea, but mostly thank you to Mr Fitzsimmons for all he has done for the College. Mrs Williams takes over as Head of School at HCC in September, with Mr Chapman, the Executive Headteacher of the Okehampton Federation offering additional support until formation of the proposed MAT in January 2018. “Holsworthy Community College staff, students and governors would like to thank David Fitzsimmons for all of his hard work and services as our Executive Head. His ‘sphere of influence’ has extended far and wide and we have all benefitted from his leadership. He has led and supported our federated primary schools of Black Torrington, Bradford and Bridgerule and tried hard to keep others open in these financially challenging times. In doing so, he has shown a tireless commitment to the education of our children from 4-16 years. In January 2003, Dave started his headship role at Holsworthy Community College, and during the last fourteen years he has made a huge contribution to this school and served his community well. He has led HCC and our primary schools through ten Ofsted inspections with an eleventh one now overdue and too many local authority visits to mention! However, I believe the snapshot that Ofsted takes is very narrow view. ‘Holsworthy Community College’ ‘The Big School’, ‘The College’, ‘Holsworthy Technology Community College’, and now often abbreviated to simply HCC, are just a handful of the names our school might be referred to. At the heart of our school has always been a leader who has passionately believed in providing the best comprehensive education possible. Over the years we have seen approximately two thousand students progress through Year 11 and out into the community, many of whom return to share with us their news and stories even after they have walked out of those blue front gates. You know you have been in a school a long time, when the children of the students that you taught are now at your school and with Dave being our Executive Head of Holsworthy Federation, this has happened to him earlier, than if we had waited for the children to have arrived here. Dave has changed many aspects of the school for the better. When we show parents around our school, who attended themselves, they always comment on how much has changed. A great number of improvements have taken place. For example, the new and improved Technology rooms, the new Science labs, new Staff room, Learning Hub, Reception and MUGA floodlights, all of which have been built or massively modernised under Dave’s care. There is not a single classroom in Sanctuary and Stanlake that has not changed. Dave, thank you for enabling all of these changes. As a teacher, Dave is a linguist and has always championed Modern Foreign Languages’ cause, demonstrated last week in his column for ‘View from the Bridge’ as well as over numerous years when he taught German. He has also been integral in the appraisal process of all of our staff and since 2012 has carried out over 400 lesson learning walks and appraisals. Dave has been our Principal and has been in charge and employed over 90% of all staff. In that respect if a place can be defined by its people, Dave has created HCC as it is today. It is not just in our locality that Dave has had an influence. For a number of years, he has been supporting colleagues far and wide. He was on the Devon Association of Secondary Heads (DASH) Executive for many years and was Chair of DASH from 2008-12. He was also a prominent Association of School and College Leaders (ASCL) Council member, where he was Chair of the Funding Committee and latterly Honorary Treasurer. Therefore, it is not really a surprise that he will continue to work in education by supporting other Heads and senior leaders as part of the ASCL Membership Support Team, both on the Helpline and as a Field Officer in the South West.